VALTRON SP2200 detergent is a high-purity liquid concentrate alkaline detergent formulated with excellent cleaning and rinsability properties. 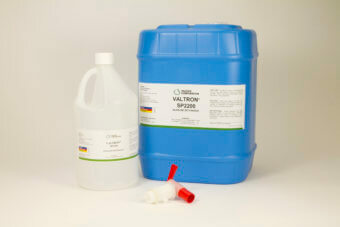 Contamination normally resistant to conventional detergents is easily removed with SP2200 detergent. VALTRON SP2200 detergent exhibits excellent solvent action and effective cleaning, and leaves no organic or inorganic residue after deionized water rinsing. The components in the formulation are completely water soluble. VALTRON SP2200 detergent is effective in contact and non-contact cleaning equipment for megasonic, ultrasonic, immersion and mechanical scrub applications. The detergent is supplied in a liquid concentrate for dilution with deionized water. Typical dilution rates are 1.0 – 2.0% by volume, but may vary depending upon the type and quantity of contamination being removed. VALTRON SP2200 detergent is available in 4×1 gallon (3.8 L) cases, 5 gallon (18.9 L) pails and 55 gallon (208 L) drums.